SCCA World Challenge Champions and CTECH proponents, Blackdog Speed Shop, recently outgrew their 20,000 square foot race shop and moved to a brand new facility just on the other end of the block. The move comes after a tumultuous 2018 racing season, in which the Blackdog team secured the GTS Sprint Team Title in the highly competitive Pirelli World Challenge Championship series. The new facility residing in Lincolnshire, Illinois, is roughly triple the size of their old shop. With their full-service Hot Rod shop in high demand, in addition to recent growth in the racing program, moving was unavoidable. The new space is configured to comfortably host Blackdog’s three major divisions; the racing team, customer-dedicated Hot Rod shop, and performance vehicle dealership, all under one roof. The Hot Rod shop features a full-size dynamometer, alignment bench, ample machine shop, and plenty of well-equipped workspace to provide speed shop services to a growing customer base. Blackdog currently offers speed shop services ranging from basic maintenance, to custom fabrication and ‘turn-key’ vehicle building. 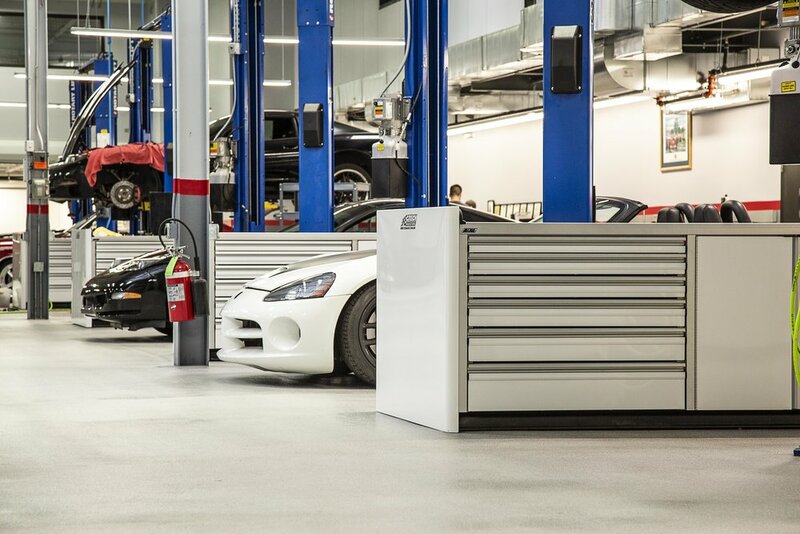 The race shop’s dedicated area features more than enough workspace to support the team’s current two-car effort as well as ‘arrive and drive’ programs. Trailers and transporters are also accommodated in the new space, along with an engine room to keep their 6.2-liter Chevrolet small block V8s in prime condition for the racing season. Of course, investing in new storage furnishings and equipment is also inevitable with the size of Blackdog’s expansion. Incredibly, all of the CTECH cabinets that the team had installed in their previous facility have moved along with them into the new building! However, new cabinets and countertop units needed to be commissioned to fully equip the expanded Hot Rod shop, and the services that go along with it. Each stall in the shop is surrounded by three individual Ultra Series cabinet/countertop units. Each provides ample, and adjustable storage for parts and equipment. The GasketLoc countertops on each unit are built to whithstand the rigors of automotive work, as well as keep spills contained to the surface of the counter. We were lucky enough to have been invited to the open house and ribbon cutting for the new Blackdog Speed Shop headquarters. There were plenty of cool collector cars, as well as racecars, on display, which really looked impressive alongside all the shiny new cabinets! Safe to say, Blackdog now has one of the best looking and well equipped shops around!